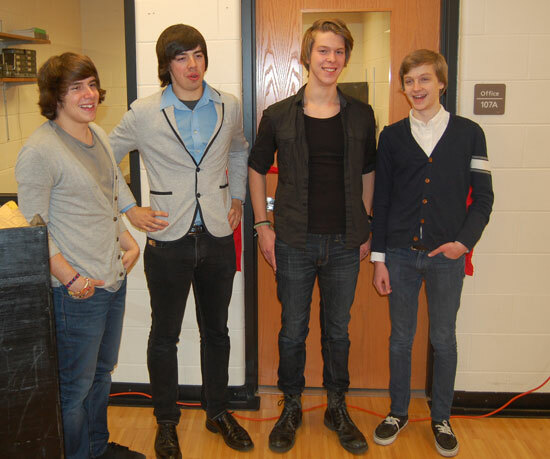 Chase Promenade poses outside of the midi lab at Wilmot High School named in their honor. Wilmot High School dedicated the new Chase Promenade Midi Laboratory tonight after the Fall Instrumental Music Concert. The lab is built around $5,000 worth of Yamaha electric pianos awarded to the school when student band, Chase Promenade, won the WSMA Launchpad Competition last school year. To honor the band’s members — Matt Spatol, Tony Diaz, Brandon Kempf and Billy Akers — the school’s band director John Sorensen asked the School Board to name the lab after the band. The band competed in a regional competition on May 13, one of four regional competitions held throughout the state, with a total of 60 bands competing. Chase was selected as a finalist for their region. Chase then competed on Saturday, June 11, in Madison at the Launchpad Competition Finals and was chosen as the State Finals Winner. The grand prize package consisted of the prestigious Les Paul Launchpad Award, 12 hours at a professional recording studio, a 2011 Summerfest gig as well as the equipment for the school. The lab will be used in a number of ways. One way is for small pop ensemble class, an advanced theory class in which students work within the context of a rock band. In the course, students will use the instruments in the new lab to figure out music Sorensen gives them. “I don’t hand them the music, I hand them recordings,” Sorensen explained, and the students apply their theory knowledge to figure out the music. The digital pianos in the lab might also be used for a new piano course and when the school hosts solo and ensemble music festivals, Sorensen said. Posted in: Uncategorized, Wilmot High School.